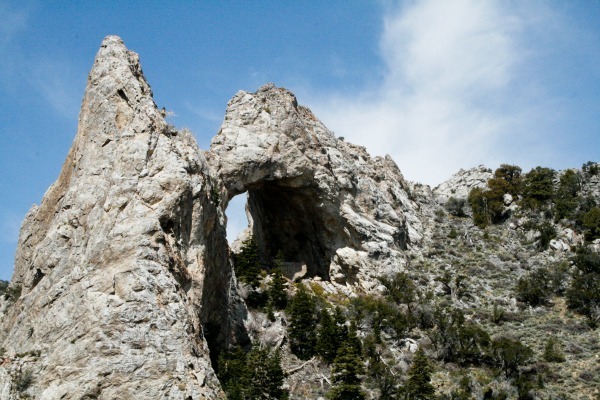 Great Basin National Park in Nevada is a hidden jewel you don't want to miss. Hwy 50 towards Great Basin National Park. Wheeler Peak (13063 ft/3982m) is off in the distance on the right. Great Basin National Park is one of the lesser known National Parks located in eastern Nevada along the Utah border outside the town of Baker. Entry into the park is free. Imagine that! Free! 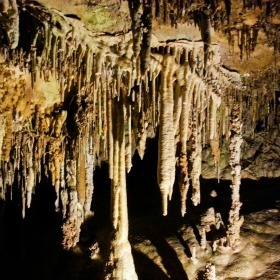 You’ll need to pay for the Lehman Cave tour and of course camping. Camping was only $6.00 during our visit but that was the off-season fee. I would describe it as a park in the middle of nowhere but, worth visiting. 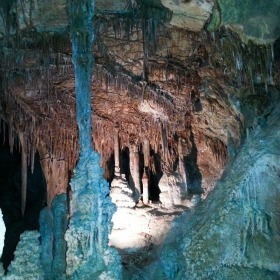 A tour of the Lehman Cave is a must. 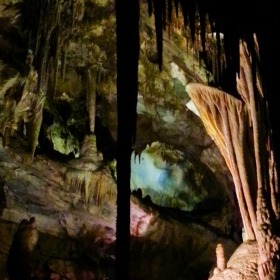 Visiting the Lehman Caves was a priority. We took the 90 minute tour and it was definitely worth it! It’s a great way to get out of the hot summer sun for awhile. 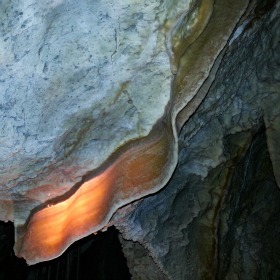 The temperature inside the cave was about 52° F (11°C). We had all good intentions to climb Wheeler Peak, but, there was too much snow at the higher elevations and afternoon thunderstorms were in the forecast as well. The road to the Wheeler Peak Trailhead was still closed, due to snow. Rather than attempting Wheeler Peak we opted to hike to Baker Lake. We almost made it there but the snow got to be waist deep when we got within a ¼ mile of the lake. If you’re planning to hike a lot in the park, you may want to plan a trip there later in the season once the snow melts. Day three we drove to Lexington Arch to do the short hike there before heading back to Colorado. 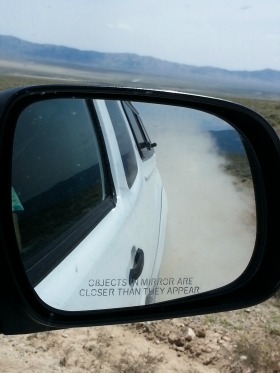 The dirt road is about 12 miles to the trailhead but after 6 miles the road gets rough. It's very dusty too. It would be better to have a vehicle with some ground clearance to get there. The last couple miles there would be a couple nice spots to free camp along the road before entering back into the Great Basin National Park boundary. An interesting thing to visit would be the Bristlecone Pine Groves. Unfortunately for us there was too much snow to reach the groves which are at high altitude. 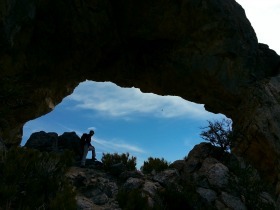 Camping in Great Basin National Park. There are 4 campgrounds in the park. Baker and Wheeler Campgrounds were still closed, but Upper & Lower Lehman Campgrounds were open. 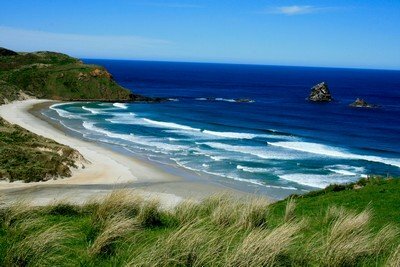 There aren’t many campsites so you’ll have to snag a site earlier in the day during the busier summer months. During our visit, water was not year available in the campgrounds but was available at the Lehman Cave Visitor Center on the north side of the building. The campground pit toilets were the cleanest I had ever seen. There was even a hint of a fresh laundry smell not the usual stinky one that can turn your stomach. There are a bunch of primitive sites along Snake Creek and a couple along Strawberry Creek. They do have tables, fire pits and pit toilets but no water. Other than that there is some camping at “The Border”. We saw the sign but didn’t stop to check it out. 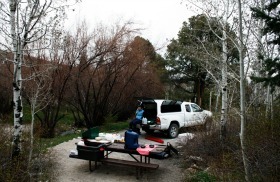 Camping can also be found on Sacramento Pass to the north of Great Basin National Park. There are a couple places in the town of Baker to get supplies. If you need a shower you can get one at the Sinclair Gas Station…..if you can find the owner that is since it’s not your usual gas station. There is a small RV Park that has showers as well. 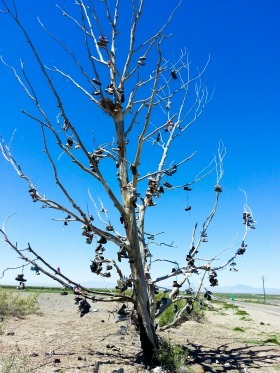 What to see on the way to Great Basin National Park from Colorado. It does take a while to get there, about 6-1/2 hours from Grand Junction, Colorado. There's not much out there but a few oddities. There are a few things to visit along the way to put a little fun into the trip.We spent the first night at the Green River State Park to Camp. We like that spot, except for the night-time trains going by. 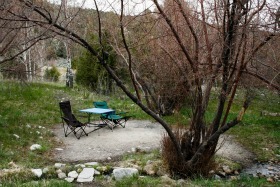 It’s a campground that’s well kept and clean. When you camp there hot showers are free. There’s a golf course next door and a boat ramp to launch into the Green River if you have a boat. There is the Crystal Geyser 4-1/2 miles to the south along the River that erupts every few hours. Keep in mind that it’s a lot less reliable than Yellowstone National Park’s Old Faithful but also impressive. 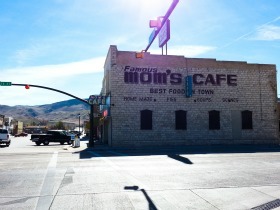 If you're hungry for some breakfast, go to Mom’s Café in Salina Utah. The café has been there for many years and probably hasn’t changed much since opening. We had delicious French toast with a couple of farm fresh eggs and enough fresh brewed coffee that left us shaking. The waitresses are fast and friendly too! If you like photography, Holden Utah along I-15 and Hwy 50 is a great place to stop. The old gas station is very photogenic. 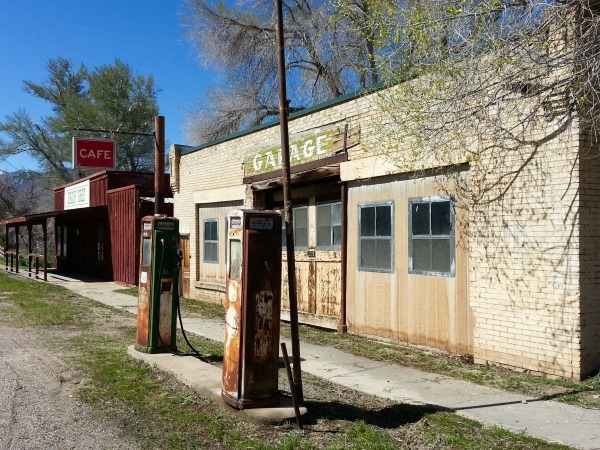 An old Sinclair Gas Station in Holden, Utah. 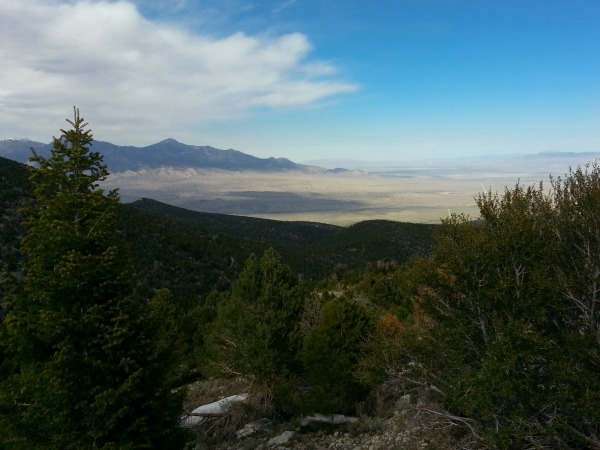 Click here to go from the Great Basin National Park page to the Camping Trips page.